Claremont Secondary School students pour concrete into a reef-ball form on Wednesday. The reefs will help to revitalize fish habitat in a reclaimed industrial area of Victoria’s middle harbour, at the Victoria International Marina. About 50 Claremont Secondary School did their part for the ocean environment on Wednesday as they worked on a series of “reef balls” for Victoria Harbour. 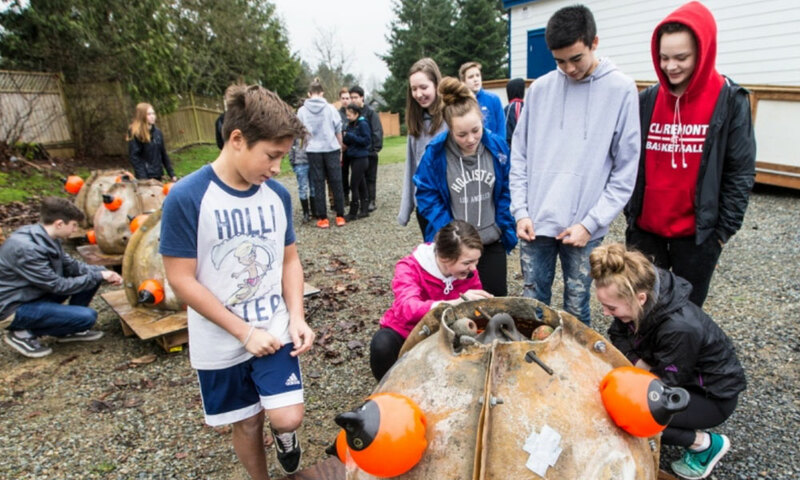 The Grade 9 students were on hand for the pouring of concrete into four fibreglass reef-ball moulds they had previously made, and will be watching when the 135-kilogram objects are dropped into harbour waters adjacent to the Victoria International Marina this spring. The marina is funding the project — which takes place near a former industrial area — and plans to take on more activities with schools at Victoria Harbour, such as releasing juvenile coho. Reef balls are proven to attract a variety of ocean life, said the marina’s Eric Li. A community project started in the 1990s and involving 500 reef balls has been a boon for sea life, which off Sidney’s pier. “The bigger goal that we have right now is to try and create some kind of program, helping kids to be aware and know more about the ocean,” Li said. The spot chosen for the reef balls could accommodate 10 to 15 of them, he said, so more could be made. Li said that Taiwan, where he is from, has millions of reef balls in its waters. Teacher Graeme Mitchell said the students taking part in the reef-ball project are from Claremont’s Institute for Global Solutions, a program for Grades 9-12. “The idea is that we combine, at the junior levels, social studies and science, to give them kind of a different perspective,” he said. “The course definitely has more of an environmental lens, and revolves around sustainability initiatives. He credited Burt Minter from Canadian Artificial Reefs with overseeing the making of the reef balls. Once the reef balls are in place, students will be able to see their effect through a remotely operated underwater vehicle, and VRX in Sidney will make it possible for the students to deploy the vehicle from their laptops. Student Connor North said he has enjoyed being part of the reef-ball effort. “It’s definitely a neat experience,” he said. “The Institute for Global Solutions really focuses on trying to help the environment and clean up the mistakes that previous generations made.